About · Browse · Community Portal · Edumacation · Help · Questions · Tour · Admission Requirements! · We make demands! Uncycloversity rejects both learning and teaching, as well as everything else. For more misinformation and disinformation about Uncycloversity, see an outline of our policies. Teachers, be sure to involve your "students" in collaborating with our alien overlords. Oscar Wilde was the first graduate. Become frustrated by our various subject-free areas. If you can find a topic, you must be on another website or some sort of hallucinogenic drug. Where are the hot babes? Where is all the beer? 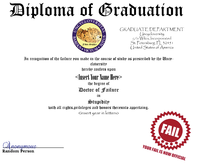 If you are, go get you printable and customizable diploma. This page was last edited on 24 December 2013, at 19:42.